I left Shanghai this morning at about 10, meeting Paulo at the airport and spent a really pleasant couple of hours talking to him about a whole range of different issues. The flight to Jeju took a little over an hour and we were met off the plane by a reception committee of local Scouts. The road from the airport to the south of the island, where the conference is being held, has banners all along it with the conference logo emblazoned on it. No-one on Jeju could possibly not know that the World Scout Conference is taking place here over the coming week. I met up with those on the delegation who have already arrived and we went through some papers during the afternoon. Then, after a break and a swim in the excellent hotel pool, we went out to a local restaurant for dinner. The restaurant specialised in horse meet, so three of us chose their gourmet menu. Raw horse steak, horse sushi, horse burgers, horse stew, horse bone soup, horse black pudding… You name it, I’ve eaten it this evening. 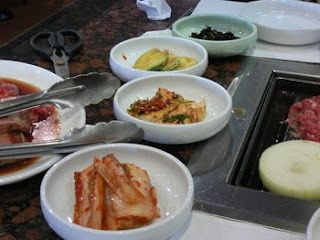 As well, of course as Kim chi, the ubiquitous pickled cabbage that Koreans like to eat with every meal. Delicious.